Photography by In Keun Ryoo. The architecture facing and adjusting the nature The site is located at the base of Bandai-san(mountain), we designed a second house for the family who living in the city. This region is designated as special heavy snowfalls area, we used more than 2m-high snow load to design a stilt structural system to protect the house from snow. The house has two blocks; a living function and a life related watery function are separately accommodated in each block. These are connected by a bridge that makes people enjoy harshness and happiness in natural environment with their five senses. “One year project” as the name indicates “move with times” which means that it took entire one year to experience the whole process such as tree cutting, sawing, fabrication, and assembling together with nature. At its heart, a house building is expected to be succeeding each process through dialogue with nature. In general, the process of cutting tree is done in the depth of winter to draw the maximum material performance. And then lumbers are seasoned for half a year or three years at most. Average construction period is about four months for general housing project nowadays, compare to the recent work situation, the one year preparation period could be quite a long time. However, the length of time we spent in this project make many stories created by people involved in each process of cutting, sawing, processing, delivery, and assembling and planting trees at the site. One hundred twenty trees with 80 to 90-year-old and approx. 40cm diameter, without any special treatment, keep the wooden original features, adjust lumber to original log size not to a standard, these diligent works make every expression of trees become alive. It usually functioning in accordance with defined regulations in modern society, we ponder that construction of the “One year project” should yield to nature. It would probably never have the chance to use up a tree until nothing left, however it makes possible by adapting the flexible method of yielding nature. We believe whenever we use natural wealth trees, we have to circulate the forest and give them better environment more than before. This is an idea of “borrow” not “receive” the resources from natural environment. After the project completion, we have to return-as-we-used to plant the same kind of trees to prepare the necessary amount of natural material for next generations. A life in a tree slowly growing from a nursery is not captivated by the times, and it moves with the people and vice versa. 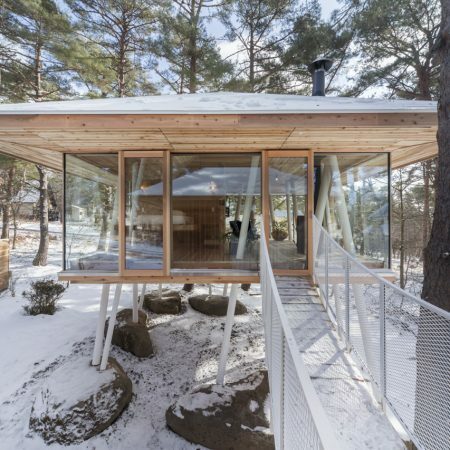 Volcanic rocks form Bandai-san are used for foundation footings, and a stilt system is adopted to build the house above the 2m-high snow a peculiar feature of this area. Two housing blocks (space of 12 and 18 ft. long) with a floor and a roof are constructed. We used the bedrock congealed lave in the ancient times as substrate that lying under 80cm below and installed 1.5m rectangular-like natural volcanic block(granite) as isolated footings. The forest of steel posts(φ89.1mm – φ165.2mm) are come up alternately from footings. These posts are connected to the wooden lattice-work stilt floor surface (beam height = 240mm) at the middle and to the square roof surface (beam height = 300mm) at the top. By supporting vertical and horizontal force by the posts, this structural system made possible to having open periphery. The foundation footing used for this project are natural rocks, so they vary in size, shape, and height. It totally depends on their true nature. Sometimes we experience an illusory feeling that as if we draw lines to design one-sidedly. But in nature we believe that we the construction side should face and communicate to the stones, trees or some such materials, exterior surroundings including climate We rediscover this process itself is the architecture. 1. Investigation in the forest. The project stared from walking in the forest and feeling familiar to the forest and finally we could select trees. 2. Lumber sawing. We made frequent timber mill visits to check the log condition and bucking method. 3. Processing. Numerous tests on samples of wooden wall and floor with a carpenter. 4. Thoroughly investigation on Bandai-stones used for isolated footings. 5. Arranging isolated footing stones. Finishing stake to keep 1.4m height difference along north and south in the site. 6. Processing footing stones. To adjust the angle of steel post, every stone has to be processed one by one. 7.Connecting the floor girder and steel posts. Steel posts are finally fixed after install the floor girders. 8. Deliver the wooden wall panels. They were fabricated in their own factory and delivered to the site. 9. Completion of framework. Assembling in order of posts, floor, roof, and installing the wall panels. Looking the living block from life related watery block. Sloped steel posts are connected to two separate levels, wooden lattice-work stilt floor and square roof. The Japanese cedar used for eaves soffit material are listings from log sawing process, and these are assembled and constructed. In this project, we let the seasons control the construction schedule. Each construction process has a best suitable time of year, for instance, trees should be cutting down and sawing in the cold months of the year. And then our team investigated the natural surroundings of the site and design the plans, and carpenters started to process on lumbers in the dry season. To shorten the construction period at the site, wall panels were fabricated in their own factory and delivered to the site. We believe that the delivery of the works does not mean the completion of the project. We try to develop a clear awareness of taking an action to restore the forest for next generations, such as plant trees-as-we-use. This is an idea of “borrow” not “receive” the resources from natural environment. Looking underneath of floating 2.5m-high floor. Steel posts are standing from the local Inawashiro made volcanic rocks (granite) used for isolated footings. Foundation footings were selected one by one with masons and thoroughly investigated to install. Panoramic view from south west. The second house located at the base of Bandai-san. Stilt structure system provides for protection from 2m snow accumulation in winter season. Investing our time in the period from the project preparation to the lumber erection, we try to promote the development in the forest circulation and local businesses. Living block: Living function and life related watery function are separately accommodated in two stilt blocks. These are connected by the bridge that makes people feel harshness and happiness in natural environment surrounding the house. Living block has four-sided glass wall. The forest will be visible from anywhere in the house. Cedar bevel sliding boards are covering the ceiling of the living and bedroom. Looking an entrance of the watery function block. Evening view from south. Using local and natural trees and rocks as architectural material, the house blends into the surrounding natural environment. Click here for more projects of Life Style Koubou.